Hi, I'm Emma, a Professional Face & Body Artist based in Kent. 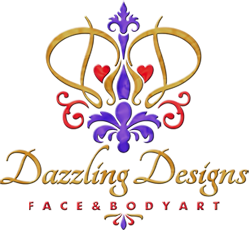 Let me add a 'Dazzling Design' to your event! I have lived in Kent all my life, brought up in the Sevenoaks area and for the last seven years have lived in Maidstone with my husband and two wonderful sons. At school I loved and studied art and very much experimenting with make-up and nails. For over 20 years I have worked in the hair and beauty industry having numerous qualifications in hairdressing including NVQ levels 1, 2 and 3, specialised in colouring after winning a Goldwell award. Since 2000 I have run my own Hairdressing business. It all started when my bestfriend said “ you were arty at school so you can do the face painting at Libbys party”. She supplied some very basic paints and brushes in a kit. Although very nervous at first I really enjoyed it especially after seeing the childrens faces when they looked in the mirror. I realised that I would love to take it further. In June 2010 I did a beginners course with Follies and followed this up with the intermediate course in November 2010. The following year in August 2011 I attended the Onestroke course with Claire Howkins to broaden my skills. 2012 started fantastically as I was trained in February by the world famous Wolfe Brothers when they were in the UK. In May Nams Nams put on a course for adult eye designs which increased the scope of my portfolio. During this time I also attended numerous workshops, jams and festivals to continue to improve and learn from my peers. My spare time is spent practising new designs and techniques taking inspiration from painters around the world.